Reddit is often called "the front page of the Internet," but for many brands it's remained a no-go zone, given the likelihood of getting flamed or trolled by anonymous users. There's just as much potential on the social platform's forums (called subreddits) to make money and generate influence and goodwill, but it too is fraught with danger. Maybe all you need is a guide. After just one year of running stealthy Reddit campaigns for tech-minded companies, Brian Swichkow, founder of nascent social-marketing firm Ghost Influence, said he now "gets calls all of the time" from agencies wanting to subcontract his work, which has the potential to quadruple a brand's social impressions. Swichkow said he attracted $500,000 in new business in just a few weeks after a campaign for an unnamed wearables product went viral. He believes companies should essentially unbrand their marketing on Reddit. 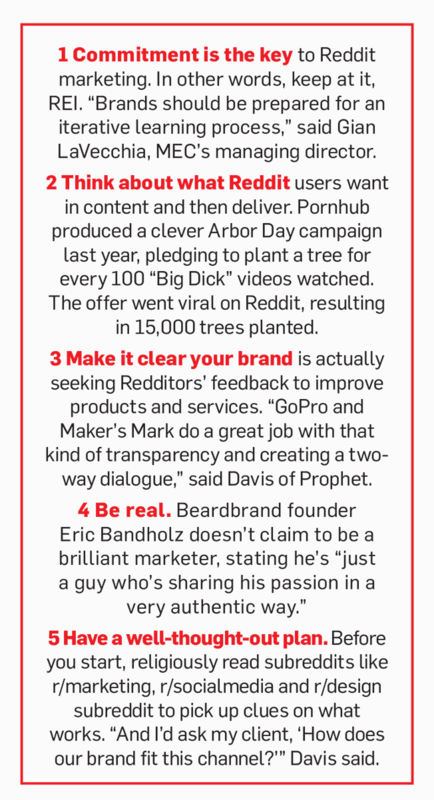 (Be sure to check out 5 other tips from Swichkow and his social-guru peers to the right.) "You have to present value to the community in the voice of the community," Swichkow said. "If you don't do that, you will fail. There's no way around it." The latest example of a marketer who got chewed up on a subreddit occurred on Nov. 10, when REI chief executive Jerry Stritzke took to Reddit's Ask Me Anything forum to humble-brag about giving his 2,000 employees Black Friday off with pay. But former staffers piled on, complaining about the company's hyperfocus on selling memberships. Any good press REI had garnered was then tempered by Reddit. The retailer, however, seems far from discouraged and may give Reddit another shot. "We are choosing to live our values and push into new territory," said REI spokesperson Bethany Hawley. There's reason to try again. The increasingly popular forum garnered 37 million visitors in October, per comScore—up 86 percent year over year. Other players that have gotten hammered by Redditors for marketing rather than sparking conversation include Amy's Baking Company and premium pen brand Pilot. "You are not going to go on Reddit and come out of it looking better than when you went in," said one agency head, who spoke on the condition of anonymity after an electronics and retail client performed poorly on Reddit. "It's too risky." Here's how risky it is: Swichkow and other agency reps declined to name any of their clients, for fear of blowing their covers and putting them in the crosshairs of reactionary Redditors (not to mention scare off future business from brands that want to stay completely on the down low). Brands must walk on proverbial eggshells during and after a campaign, hoping that the virtual pitchforks and torches never scare them off the message. "REI is a great example," said Scott Davis, chief growth officer for consultancy Prophet. 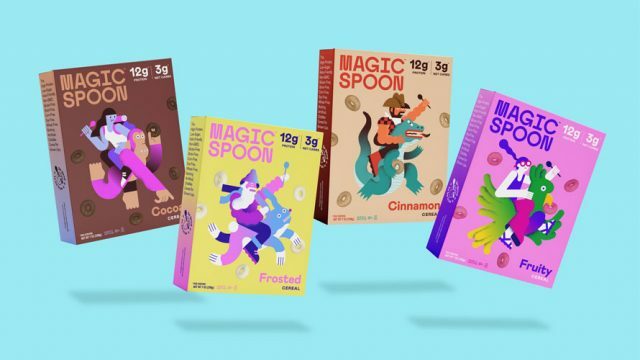 "Two weeks ago, I would have said it would be perfect to jump onto Reddit to have an open conversation because of the brand's [positive reputation among consumers]. But you saw what happened, and that is the reality of Reddit—the conversation can take you in a million different directions." That said, when content works there, it can be among the most effective social tools out there. E-commerce startup Beardbrand is making $120,000 a month via its Reddit marketing, a much greater impact on its revenue than efforts seeded on Facebook and Twitter. HD camera maker GoPro has found its own type of success on Reddit. "Most of [our] threads are positive forums ranging from highly sophisticated exchanges between professional filmmakers to enthusiasts sharing tips and tricks with new users," said Kelly Baker, marketing rep for GoPro. Swichkow explained his theory behind the successful examples: "Because users find the information in such an intimate environment—subreddits can consist of small groups—they are much more likely to adopt the info as their own. They'll then carry the idea as their own to Facebook, Twitter and the bar. 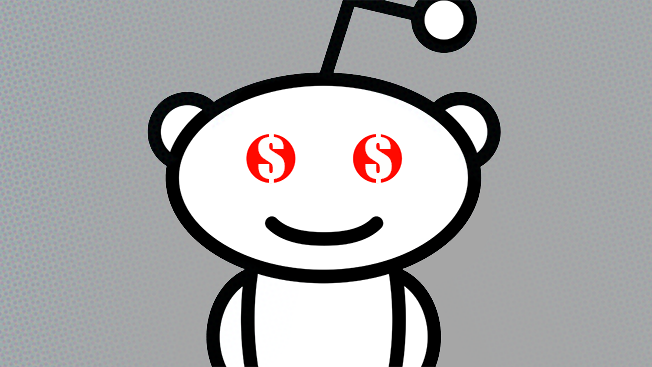 So landing something on Reddit is huge for a brand because you capture these advocates." For marketers, the bottom line is don't turn those friends into enemies.